Easy-to-use tool to split or cut MP3 without re-encoding. It keeps exactly the same sound quality of original MP3 files. 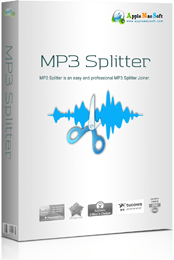 The easiest and quickest way to split, trim cut MP3 audio files without losing sound quality. It is ideal for split large MP3 audio into multiple smaller pieces (tracks), cut off the silence segment or remove unwanted sounds from your audio recording. Designed to be easy and intuitive to use, Just drop your MP3 directly into application, the program will automatically split MP3, M4A or AAC file into equal sized parts using split by duration, file size, number of files or use the automatic silence detection feature, as well as associated CUE file. This easy MP3 splitter can also view the MP3 file using wave graphics and manually set the cut points visually. The new audio files will have exactly the same sound quality as the original. 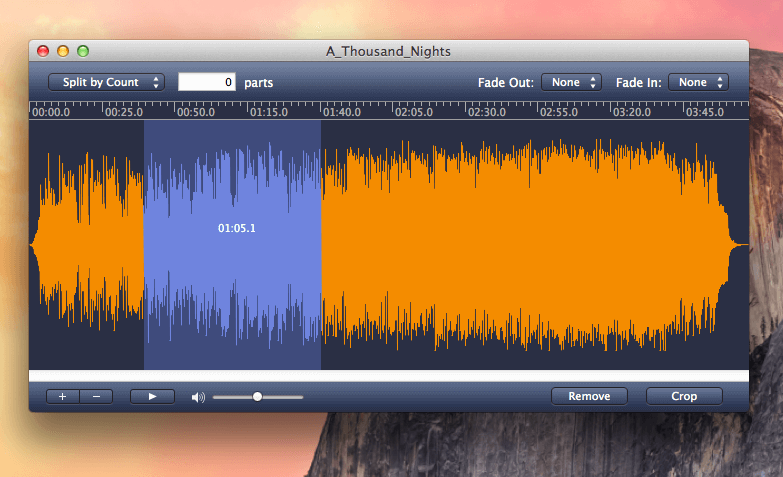 You can even add smooth fade-ins/outs effects to new audio files for perfect playback. The software is very useful for split a long audiobook into separate chapters, split MP3 albums, audio tapes, iTunes music, recorded sounds, converted CD tracks and so on. If you're looking for an application to helps you for MP3 Splitting, you won't be disappointed in AppleMacSoft MP3 Splitter for Mac ! 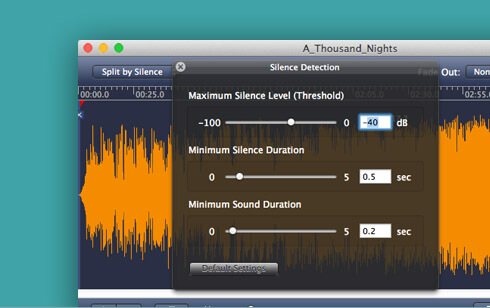 4 kinds of split modes: By By count, file size, by Time and by silence detection. New fast engine for cuts large MP3, M4A and AAC into small audio files without quality loss. Slice your Audiobooks - Automatically split an audiobook into separate chapters. 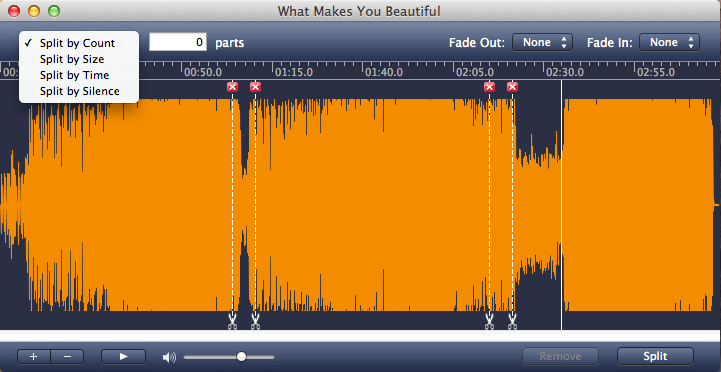 Visually split and cut audio files using waveform. 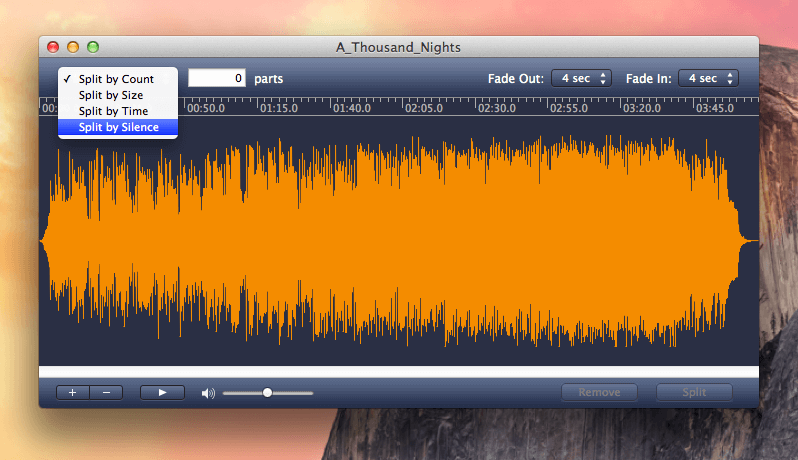 Easily cut unwanted parts from any sound file with one click. Cut any parts from audio file without recompression. With built-in silence detector, MP3 Splitter makes it easy to automatically split an audio file into several parts separated by silences. Supports MP3, M4A and AAC formats. Cut your favourite part, Easily make your own ringtones using the crop & fade features. 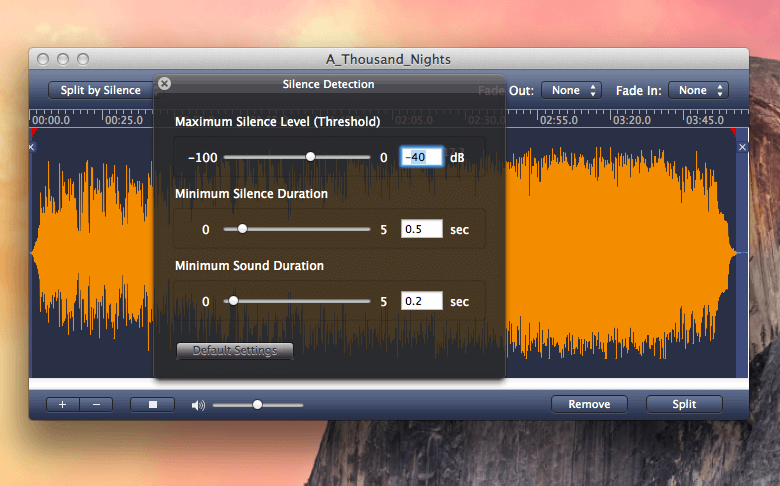 Add fades in or fades out, smoothly goes from full volume to zero volume or from zero volume to full volume. The built-in player allows you to pre-listen the MP3 audio files. Keeps ID3 tag including ID3v1 and ID3v2 while splitting. The built-in audio player will help you define the right position for cut line. Adjust or specify silent fragments on the waveform. Support change the scale of the timeline. Intuitive and simple drag&drop interface. The Original quality is preserved - no re-encoding. Lifetime updates: future updates free. Try all features – with no time limit. Fully compatible with macOS 10.13 High Sierra. You may try out AppleMacSoft MP3 Splitter un-registered for as long as you want. all features are unlocked for you to try out! Download and ready to use within minutes.